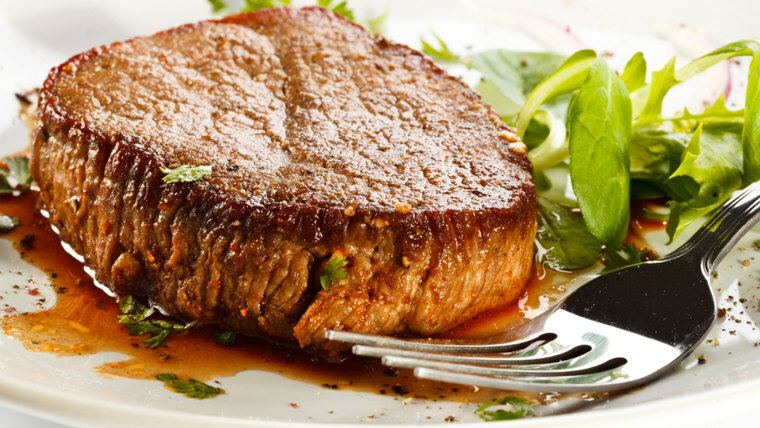 If you've not already tried the paleo diet, your carnivorous friends probably have. People who follow the carb-shunning menu believe it can doing everything from keep diabetes in check to speeding weight loss through the elimination of refined sugar, dairy and processed foods. As much a philosophy as an eating plan, the paleo lifestyle is based on the idea that paleolithic humans — our ancestors who lived 10,000 years ago — had a superior diet. It's a carnivore's paradise, promoting grass-fed meats and animal protein for every meal, including parts you may have typically discarded, like organs. It also encourages all kinds of vegetables, fruit, eggs, seafood, raw nuts and seeds, and added fats such as avocado and olive oil. Some starchy vegetables like sweet potatoes and yams are included. But the diet also shuns nutrient-rich grains, including legumes (soy, beans, peanuts) and whole grains, which are demonized in paleo even though a recent report from Harvard School of Public Health found that a daily serving of whole grains lowers a person's risk of dying from heart disease by 9 percent. Cutting added sugars is a great idea for anyone, but credible nutritionists consider a strict paleo diet to lack nutritional balance, falling short in essential nutrients like calcium and vitamin D, for example. There's no scientific evidence that paleo helps prevent disease. You may love paleo — its many followers are deeply committed — and you may see benefits from cutting calories, sugar and highly processed foods. Many people find it too restrictive. There are some easy ways to stay true to the basic premise of the program, but adapt it to fit into a busy life. Think of it as a kind of "Paleo Plus Plan." 1. Try to trim the animal protein portion of your meals, swapping in some plant proteins, like beans and legumes. Fats like coconut oil, butter, clarified butter, beef tallow, lard and duck fat get a thumbs-up on paleo. But it's unclear whether these saturated fats are neutral or harmful when it comes to promoting risks of heart and vascular diseases. I have a feeling our ancestors would have been comforted by a steamy bowl of chili in those cold caves. Beans —supplying about 16 grams of protein per cup, the equivalent of more than 2 ounces of meat — can help satisfy you without the cholesterol that animal products provide and simultaneously, they supply soluble fiber that could actually help reduce cholesterol levels. 2. Go with the grain. The popularity of ancient grains like amaranth, millet, oats and teff (and seeds like quinoa and chia) are bringing us back to the foods of our ancestors, including whole grains that are versatile, clean, and naturally delicious. Carbohydrates have a bad reputation, justified by the company they often keep (rich sauces, butter) and the forms in which they may be served (cronuts and pastries.) Fiber-rich carbs in the right portions supply energy, fiber, a host of vitamins and minerals and a soothing satisfaction that could keep us from eating less nutritionally dense choices. 4. Don’t ditch dairy. Unless you have an allergy or intolerance to dairy, these foods are rich in calcium and potassium, two minerals we fall short in obtaining, as well as protein, posphorus, magnesium, potassium, vitamin B12, vitamin D and zinc. Choose low- or non-fat dairy sources to reduce calories and saturated fat. 5. Proceed with caution regarding weight-loss diets that have long allowed and avoid lists. Diets that cut out whole food groups will cut out valuable nutrients. Balance is best whether you’re trying to lose weight, gain weight or stay just as you are.